“British” Sky Broadcasting is no more. The group is buying sister Sky units in Germany and Italy for at least 4.9 billion pounds ($8.3 billion) in cash from Rupert Murdoch’s Twenty-First Century Fox. That transforms the investment case for the UK’s top pay-television group. The price looks reasonable. BSkyB will pay 2.5 billion pounds for Fox’s wholly-owned Sky Italia: 2.1 billion in cash, and the rest via a stake in the National Geographic Channel. That’s about 10 times EBITDA, and lower than many analysts feared. In Germany, BSkyB is effectively paying the market price, buying Fox’s 57.4 percent stake in Sky Deutschland for 2.9 billion pounds, and making a mandatory tender offer to outside investors at the same level, of 6.75 euros a share. This has been mulled for years, and is in a sense a housekeeping exercise. The businesses have common branding and already collaborate on technology and productions, while executives flit from one to another. So 200 million pounds of mostly cost-based annual synergies, which BSkyB reckons have a net present value of 2 billion pounds, is punchy. The deal logic is helped by cheap debt – BSkyB is borrowing at less than 4.5 percent. Fox is also keen for cash. It wants to keep rewarding shareholders, even as it pursues Time Warner. But “Sky Europe” is more than a tidy-up. BSkyB cuts its reliance on Britain, where it is now fighting the deep-pocketed BT, and gets new growth potential. More than half of Britons already pay for television. The comparable figures are 19 percent in Germany and 28 percent for Italy. The bigger group should be able to better hold its own against tech, telecoms and content giants. There is a cost. Even though BSkyB is prudently raising equity, leverage will rocket from 0.7 times EBITDA to at least 2.9 times, or four times should it get all of SkyD. These are racy levels for a public European blue-chip, especially one that must write big cheques for sports rights. Cash returns will shrivel. A 500 million pound annual buyback has been halted, although dividends will keep rising. The Sky drama just got more exciting. But it may also keep investors closer to the edge of their seats. 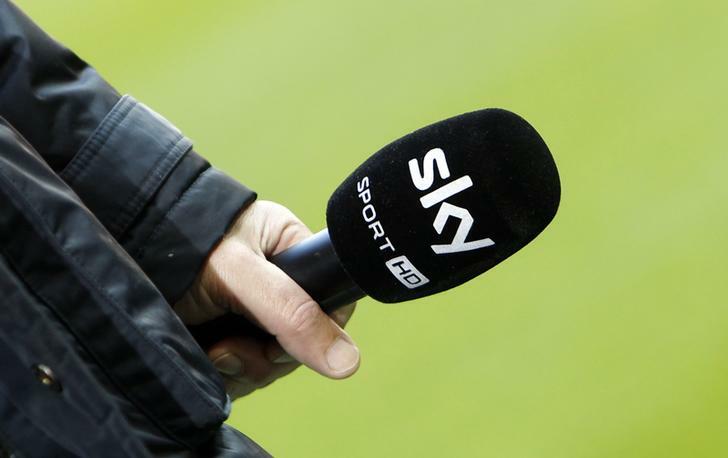 A microphone of Sky Sport TV station is seen before the German Bundesliga first division soccer match between Bayern Munich and Hoffenheim in Munich March 10, 2012. British Sky Broadcasting will pay at least 4.9 billion pounds ($8.3 billion) in cash to buy sister satellite companies in Germany and Italy from Rupert Murdoch’s Twenty-First Century Fox. Fox is selling its full ownership of Sky Italia and its 57.4 percent stake in Sky Deutschland, and is receiving BSkyB’s 21 percent stake in National Geographic Channel as part of the deal. The U.S. group is also BSkyB’s biggest shareholder. BSkyB is also making an offer to buy out minority shareholders in the Frankfurt-listed SkyD at 6.75 euros per share. That matches the price paid to Fox and is at the minimum level permitted under German takeover law. BSkyB has arranged 6.6 billion pounds of loans to part-fund the deal, and is expanding its share capital by just under 10 percent, placing 156.1 million new shares. Fox is buying 61.1 million shares, maintaining its holding in BSkyB at 39.14 percent. BSkyB’s net debt will rise to 2.9 times EBITDA if no outside SkyD shareholders sell their stock. If all minority shareholders sell, BSkyB’s cash outlay will rise to 7 billion pounds and leverage will hit four times EBITDA. BSkyB expects the deal to close in October or November and aims to make 200 million pounds of annual synergies by June 2017, at a cost of 150 million pounds. The “vast majority” of this will be cost synergies, Chief Financial Officer Andrew Griffith told journalists on a conference call. Shares in London-listed BSkyB stood 2.7 percent lower by 0804 GMT at 900 pence. SkyD shares rose 1.4 percent to 6.755 euros.